This is the simplest and most convenient way to support OC student success. These gifts also qualify for maximum income tax deductibility. Unrestricted donations are used wherever the need is greatest. You may also direct your gift to The Campaign for OC or a designated fund. Honor a life by transforming a life. Your tribute gift to the OC Foundation is a meaningful way to convey sympathy, memorialize a loved one, celebrate a milestone or honor a special person's life and accomplishments. Your legacy gift can support student success for generations. The Olympic College Foundation is a founding member of Leave 10 for Kitsap, a campaign to strengthen our community and transform more area residents into philanthropists by educating, inspiring and encouraging them to leave at least 10 percent of their estates to charity. 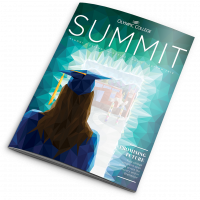 There are many other ways to support OC student success, including in-kind donations, employer matching gift programs, Amazon Smile, and gifts of tangible property and real estate. To discuss your options, please contact Executive Director David Emmons at 360-475-7120 or by clicking below.